In January 1919 Automobile Dealer and Repairer, vol. XXVI, no. 5, reported, "It is announced that the rights to manufacture radiators for automobiles, trucks and aeroplanes under the Livingston patents, formerly owned by the Livingston Radiator and Mfg. Co., at 205 West 75th Street, New York, have been purchased by the Livingston Corporation at the same address. The new corporation also takes over all the mechanical equipment of its predecessor, and will place the production of this type of radiator on a quantity basis. A new management will have charge of the affairs of the new organization. The inventor, D. McRa. Livingston, again becomes associated with the manufacture of radiators under his patents, and will be vice-president and consulting engineer. E. G. Hines is president and general manager. The Livingston Radiator was specified for installation on over 50 per cent of all aeroplanes purchased by the aerial forces of the U. S. Army and Navy." Livingston Automotive Radiators were located in this building at the corner of Amsterdam Ave. and 75th St. from 1914 to 1922. The building itself, 318-330 Amsterdam Ave. / 201-205 W. 75th St., is an officially designated New York City landmark. Completed in 1890, it was used as a stable by the New York Cab Co. until 1909. For more of the history of 205 W. 75th St. see the New York City Landmarks Preservation Commission report for the New York Cab Company Stable, 14 Nov. 2006. 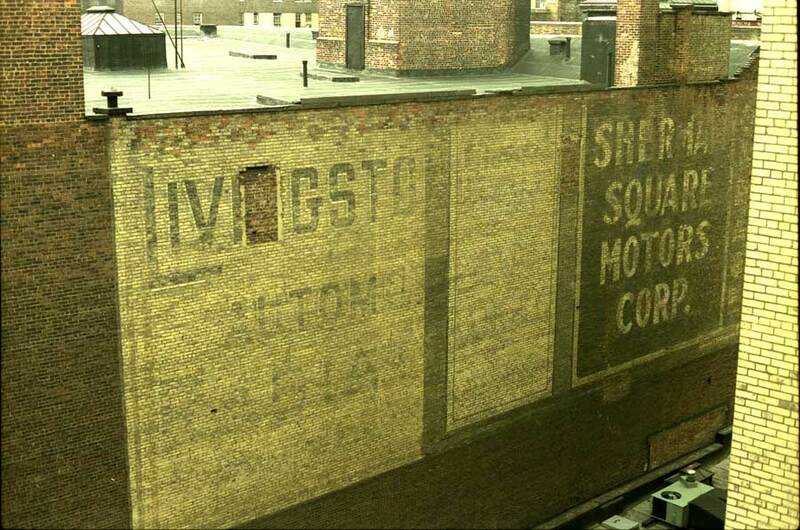 The Livingston Radiator Co. first appeared in New York city directories in 1907 when located at 6-10 E. 31st St. This ad from 1909 gives the address as 6 E. 31st St. The business name became Livingston Radiator & Mfg Co. around 1909. This company moved to W. 52nd St. by 1910, where Ernest G. Bruckman was listed as president in 1911. This ad from 1910 gives the address as 312 W. 52nd St. This ad from 1914 gives the address as 52nd St. & 7th Ave. During the years 1914 to 1922 Livingston also had other addresses along W. 75th St. This ad from 1915 shows 301 W. 75th St. Another from the same year shows 306 W. 75th St. The inventor of the Livingston Radiator was Duncan McRa Livingston (1867-1932). His death certificate, executed 5 May 1932 in Charleston, South Carolina, states that he was born in New York City 15 Nov. 1867 and that he died in Charleston, aged 64 years, 5 months and 18 days, at 6:30 P.M. 3 May 1932. The causes of death included kidney failure and stomach cancer. Livingston seldom used his first name, preferring to go by D. McRa Livingston. He was recorded in the 1900 U. S. Census at age 32, an engineer, living with his mother at 67 E. 52nd St., Manhattan. In Trow's New York City Directory, 1910, he was listed as president of the Livingston Radiator & Mfg. Co. at 312 W. 52nd St. In 1919 Livingston applied for a passport in order to travel to Europe in order to "dispose of patent rights" in England and France. On this application (issued 13 June 1919) he said that he was 51 1/2 years old and that he was born 15 Nov. 1867 at 28 West 21st Street, New York City. In 1930 Livingston, age 62 and retired, lived in Bradenton, Florida. In 1932 the New York Times, 5 May 1932, noted Livingston's death with this brief notice which misspells his middle name, "Charleston, S. C., May 4. - D. Mora Livingston, retired civil engineer and inventor, died yesterday at his residence here." Livingston was a member of a socially prominent family. The New York Social Register, 11 Dec. 1911, listed him living at 159 E. 36th St., Manhattan, with his wife, Margaret L. Clarkson Livingston. His mother, Mary S. McRa (1839-1923), is portrayed in a small watercolor on ivory at the New-York Historical Society, and her biography reads, "Mrs. Henry Walter Livingston (1839-1923): Mary S. McRa was the daughter of Powell McKa [sic] of Charleston, South Carolina and Julia (May) McRa of Baltimore. In 1865, Miss McRa married Robert L. Livingston (d. 1877). In 1882, after the death of her husband Mrs. Livingston married Henry Walter Livingston (d. 1888), her first husband's older brother. From 1900 until her death she lived with her daughter Jacqueline in Paris. Her other children were Duncan McRa Livingston and Robert L. Livingston, Jr." In 1899 Mrs. Henry W. Livingston was listed in the New York Social Register as, Mrs. Henry W. Livingston (Mary S. McRa), 67 East 52nd St. With her were Miss Jacqueline Livingston and the Messrs. Duncan McRa Livingston and Robert L. Livingston. Another important figure at Livingston Radiators was Ernest Gustave Bruckman (1870-1954). Directories indicate that Bruckman was president of Livingston Radiator & Mfg. Co. from around 1911 to 1919. A passport application dated May 1919 indicated that Bruckman was born in Brooklyn 1 Nov 1870 and that he was traveling in 1919 "to " dispose of patent rights for a special kind of radiator." An attachment dated August 1919 to this application requesting that his wife be allowed to travel under the same passport indicated that Bruckman tried to continue marketing Livingston Radiator patents under his own Brookhill Corp. firm name. By this date Bruckman had changed the spelling of his name to Brookman, and he appeared under the name Ernest G. Brookman in the U. S. Census reports of 1920, 1930 and 1940. In 1920 Ernest Brookman lived in Manhattan and his occupation was "manager airplane [radiators?]." By 1930 he had moved to Pasadena, Calif., and his occupation was "poultry business." In March, 1922, Automotive Topics reported the incorporation of Sherman Square Motors Corp. "to conduct an automobile and garage business." They were located here from 1922 to 1939. According to the New York City Landmarks Preservation Commission report for the New York Cab Company Stable, 14 Nov. 2006, "In addition to managing a three-hundred-car garage, [Sherman Square Motors] operated an auto repair shop."